MCE British Superbike star Glenn Irwin will make a sensational return to the Vauxhall International North West 200 next month on the PBM Be Wiser Ducati. The Carrick man will ride the factory-supported Panigale R in both Superbike races at the famous road race on the north coast, where he made a stunning debut in 2015. Irwin shocked onlookers with a blazing performance in the Supersport races, finishing on the rostrum in race two to make up for the disappointment of a retirement in the first race on the Gearlink Kawasaki, when he was battling for the lead with 17-time winner Alastair Seeley. The 27-year-old focused on the BSB series as a rookie last year after joining five-time champion Shane ‘Shakey’ Byrne in Bird’s Ducati outfit. However, the Carrick rider will be back in action at the 8.9-mile Triangle course from May 9-13 and says the opportunity to race at such a huge event on home soil was too hard to resist. “I went to Macau last year so effectively that was my road racing return, but the main reason why I want to do the North West again is simply because I just love racing at home,” Irwin told the News Letter. “I appreciate the support I get back home and I like to try and give something back when I can. It’s such a big event and I know that a lot of people have been eager to see me back racing again at the North West, so it’s nice to be able to give them what they want and I’m over the moon. “But also there’s an element of unfinished business. In my own head, I don’t think I’m the favourite but the story could change come Thursday night after I’ve had two days on track,” he added. With his first season in the British Superbike Championship successfully completed, Irwin made the long trip to the Far East last November to race at the Macau Grand Prix. 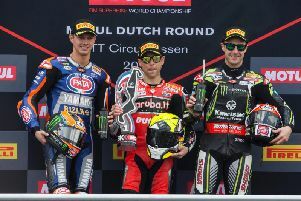 Incredibly, he was in contention for the podium as a newcomer and was battling with eventual winner Peter Hickman, Michael Rutter and Martin Jessopp when he was forced out on the penultimate lap with a machine issue on the PBM Ducati. For that reason, expectations will be high at the North West and Irwin – who competed in his first road race at the Ulster Grand Prix in 2014 – admits he expects to be right in the mix. “We’re going to be thereabouts at the North West as much I’d like to play it down, but one thing I will say is that safety will be the priority. “That’s how I approached the Ulster Grand Prix, the North West and Macau and I’ll stick to my guns: if I’m in the hunt to win the race I’ll have a go, but if not I’ll just take that same approach and stay safe,” he said.